Amid controversies over embryonic stem cell research, drugs using adult cells are already bearing fruit. NEW YORK (Fortune) -- When it comes to stem cells, the public -- and the media -- tend to focus on embryos. But researchers and analysts say marketable therapies already are emerging from less controversial work with adult stem cells. Adult cells make up the lion's share of the stem cell space, mainly because they are easier to come by than embryonic cells, and less expensive to run in clinical trials. They are also derived from mature tissue, like bone marrow or umbilical cord blood, so they avoid the ethical debate that surrounds embryonic stem cells. To be sure, many researchers consider embryonic stem cells to be more versatile, and they may someday be more useful than adult stem cells in treating diseases. 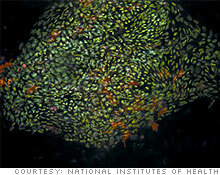 But researchers also hope adult stem cells can help them combat a variety of maladies from diabetes to heart disease. In fact, adult stem cells are currently the only type of stem cells used in transplants to treat diseases, such as cancers like leukemia. Furthermore, researchers are far closer to commercializing drugs based on adult stem cells than any product based on embryonic stem cells. The investment opportunities. But despite the differences between adult and embryonic stem cells, the stocks of all stem cell companies tend to trade in tandem. That's why the shares of adult stem cell companies also got a boost when the Obama administration decided to loosen restrictions on federal funding for embryonic stem cell research. "Whatever is good for embryonic [stem cells] is good for adult [stem cells]. Investors at least at this point don't really tend to differentiate much between the two," says Ren Benjamin, a senior biotech analyst from Rodman & Renshaw. Some analysts say investors should heed the differences. Robin Young, a medical industry analyst from RRY Publications, estimates that gross sales of adult cellular therapies will be well over $100 million in the United States this year. By 2018, he says stem cell therapy revenues could grow to $8.2 billion. Indeed, several pharmaceutical companies are now taking notice of research advancements in adult stem cells -- and their proximity to reaching the market. "Adult derived cells are the ones that have been studied for the past 10 to 15 years and are ready for prime time," says Debra Grega, the executive director of the Center for Stem Cell and Regenerative Medicine at Case Western Reserve University. "Large pharmaceutical companies are now wanting to get into the adult stem cell therapeutic area. That indicates to me that there is enough safety and enough efficacy that they are willing to put money in." Pharmaceutical giant Pfizer (PFE, Fortune 500) announced in November that it would invest up to $100 million in regenerative research, which would include both adult and embryonic stem cell research, over a three to five year period. Ruth McKernan, the Chief Scientific Officer of Pfizer's Regenerative Medicine Unit, says she has observed more interest in regenerative medicine by other pharmaceutical companies as well. The overall stem cell market, however, is still quite small. The California-based outfit Geron (GERN) dominates the embryonic market, and is perhaps 10 years away from commercializing a spinal cord treatment based on its research. The frontrunner in the adult stem cell space is Osiris Therapeutics (OSIR). Last year, the biotech Genzyme (GENZ) paid Osiris $130 million up front, with another $1.2 billion to be paid in potential milestones, to develop two new adult stem cell treatments. Osiris's star drug Prochymal is used to fight graft-versus-host disease, a painful illness that can afflict transplant recipients. Osiris says the FDA could approve the drug within a year. If successful, Osiris would be the first company to win approval for a stem cell drug. Other companies moving forward in the adult stem cell space include Stem Cells Inc., Cytori, and Aastrom Biosciences. And so while there's just one star in the embryonic stem cell universe, a whole constellation of adult stem cell drugs could be just around the corner.